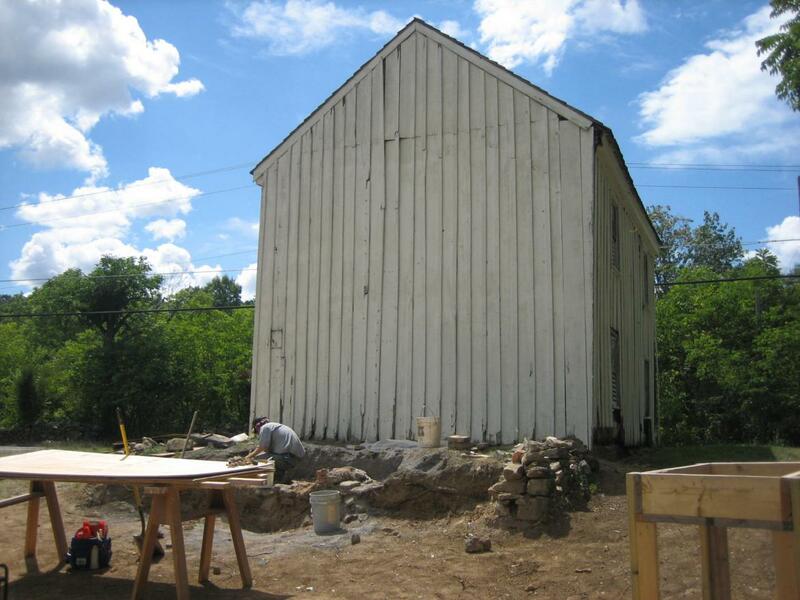 The William Patterson House on the east side of the Taneytown Road in Gettysburg National Military Park is being stabilized. 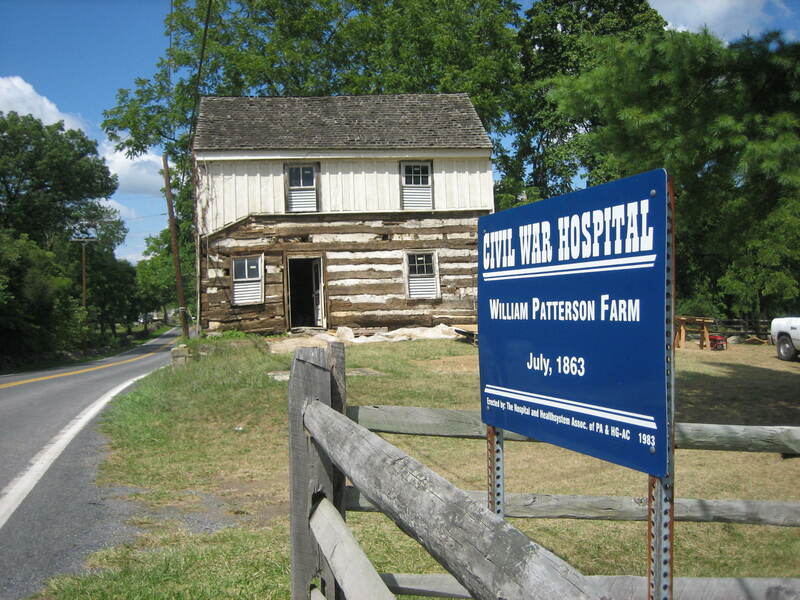 It served as a field hospital on July 1, 1863, and after the battle was over. This view was taken from the south facing north at approximately 2:45 PM on Monday, August 11, 2008. 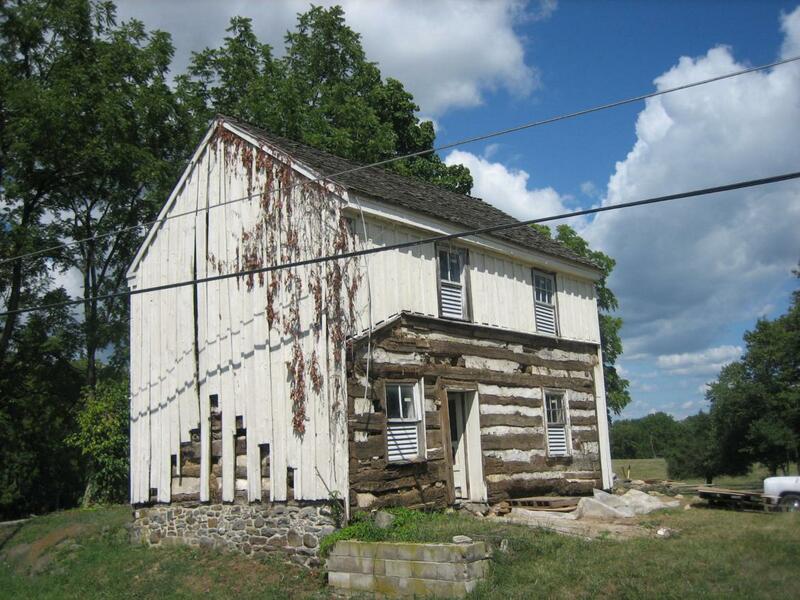 The William Patterson House on the east side of the Taneytown Road in Gettysburg National Military Park is being stablized before it falls in upon itself. 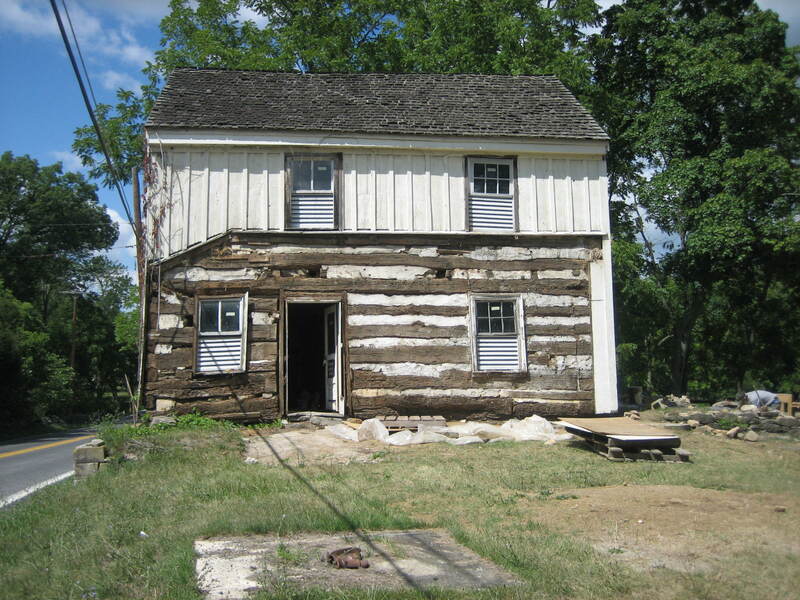 The house was originally a log structure when it was first constructed in 1796. Later on board and batten siding were added, and also a second story. The building will not be opened to the public or become a park residence. 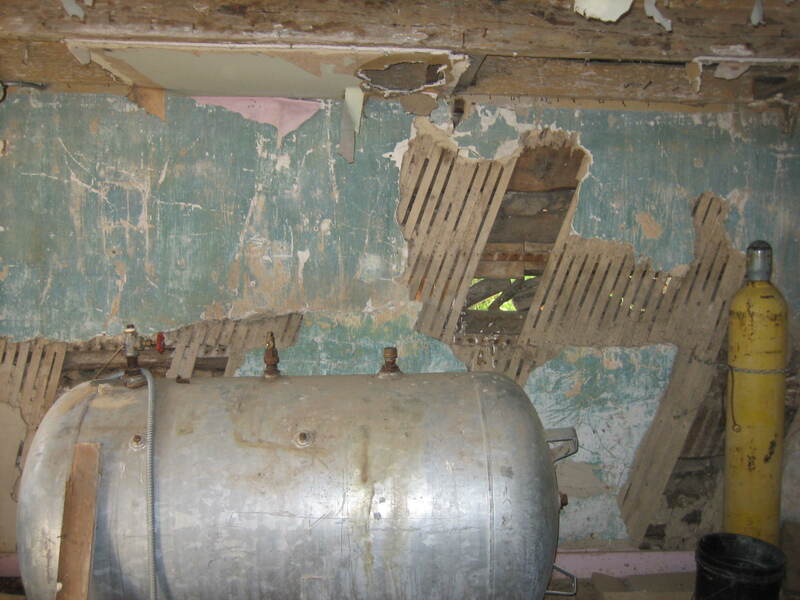 On July 2, 1863 and July 3, 1863, Confederate artillery shells coming into and around the house forced it to be abandoned as a field hospital on those days. It became a field hospital again after the fighting was over. It is believed that two artillery shells entered the house during the battle. This view was taken from the northwest facing southeast at approximately 2:45 PM on Monday, August 11, 2008. 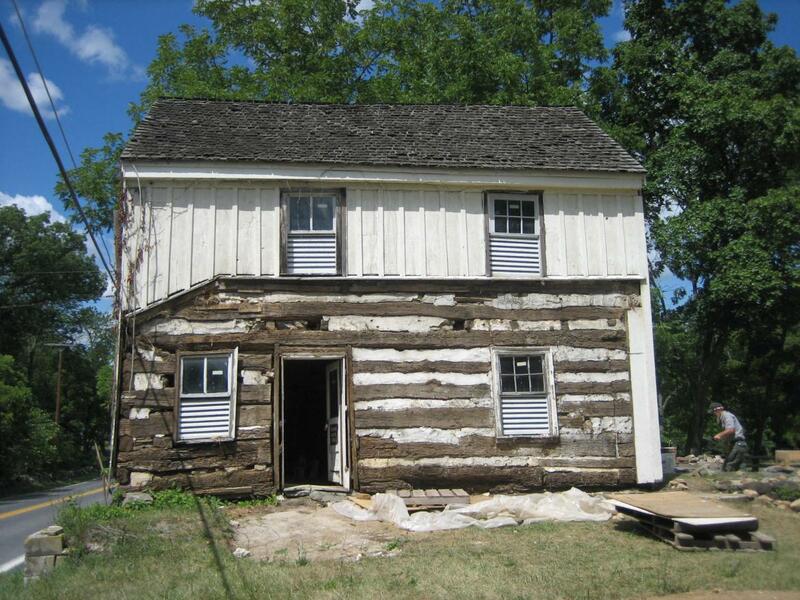 When it was originally constructed it was a log structure. 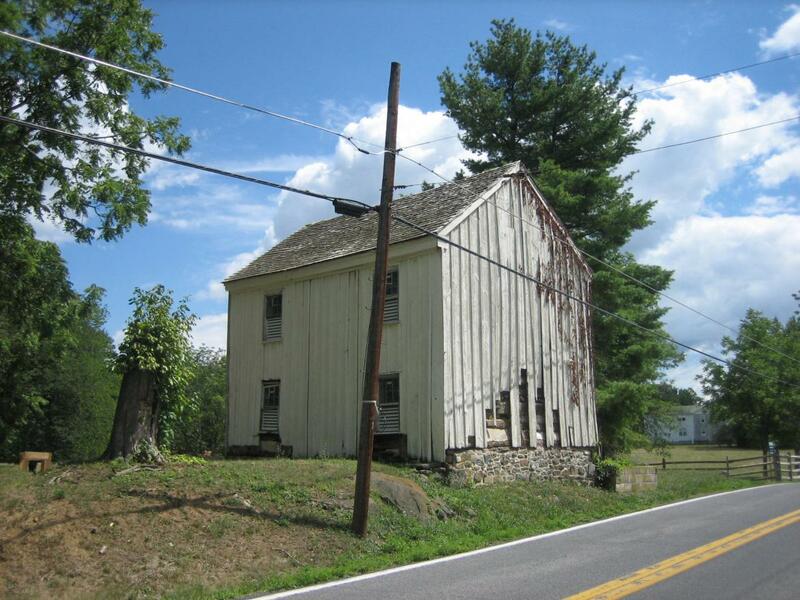 The board and batten siding was added sometime around 1820-1850. The board of course is the wide flat boards, and the batten is the small strips nailed on top of the wider boards. This view was taken from the northwest facing southeast at approximately 2:45 PM on Monday, August 11, 2008. The logs on this side of the building need to be replaced, mostly due to a combination of dry rot, water, beetle and termite damage. The first “good” log is the second one over the door frame. Around the middle of October, the house will be lifted up, and the lower logs replaced. This view was taken from the south facing north at approximately 2:45 PM on Monday, August 11, 2008. National Park Service Seasonal Mark Patterson is excavating the kitchen which would have stood on this east side of the house. 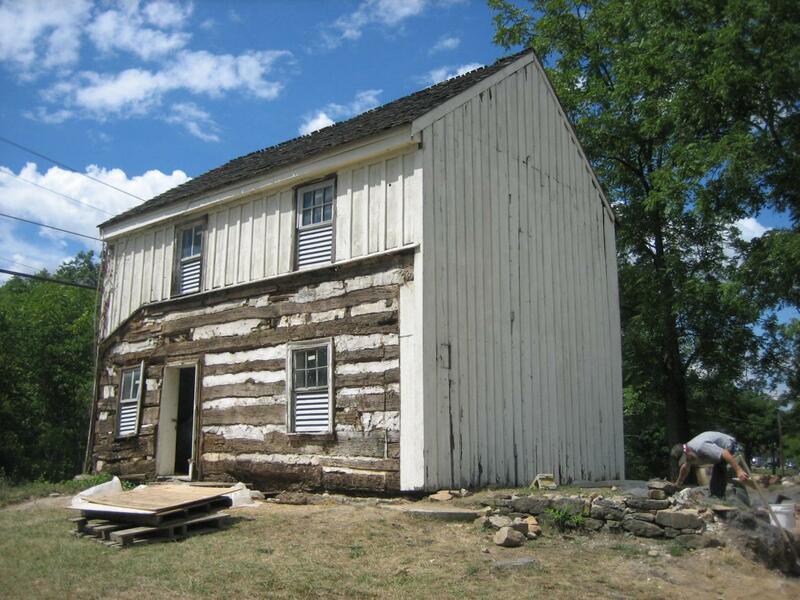 When the building was first constructed it was one story and had a separate stone or frame kitchen. 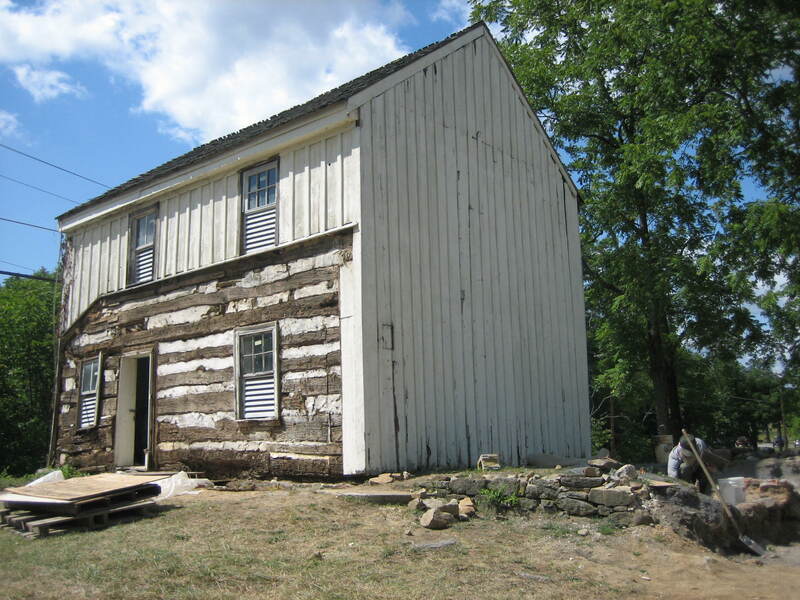 Around 1820 the second story was added, and the kitchen was connected to the rest of the house. This view was taken from the east facing west at approximately 2:45 PM on Monday, August 11, 2008. 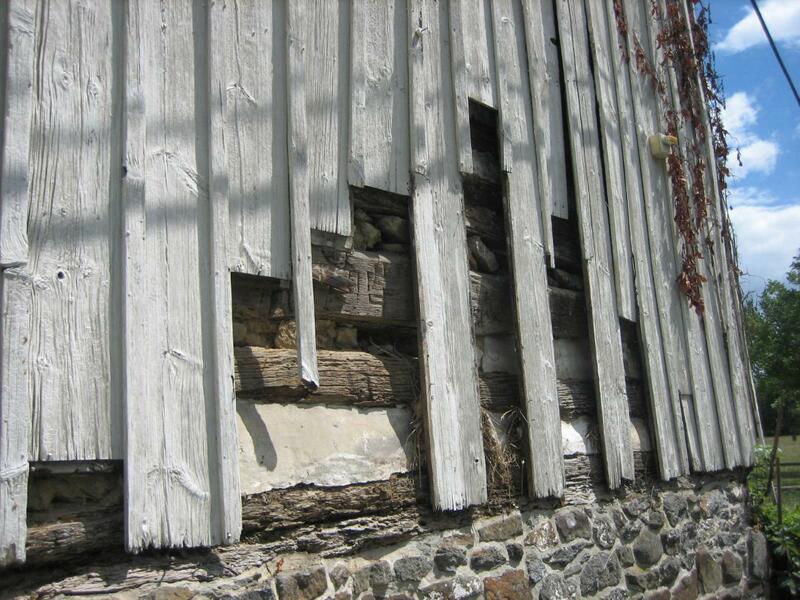 The south wall on the inside of the house shows wooden hand lathes on logs, which at one time were painted white. The dark colored covering is a mud with animal hairs used as the initial layer. 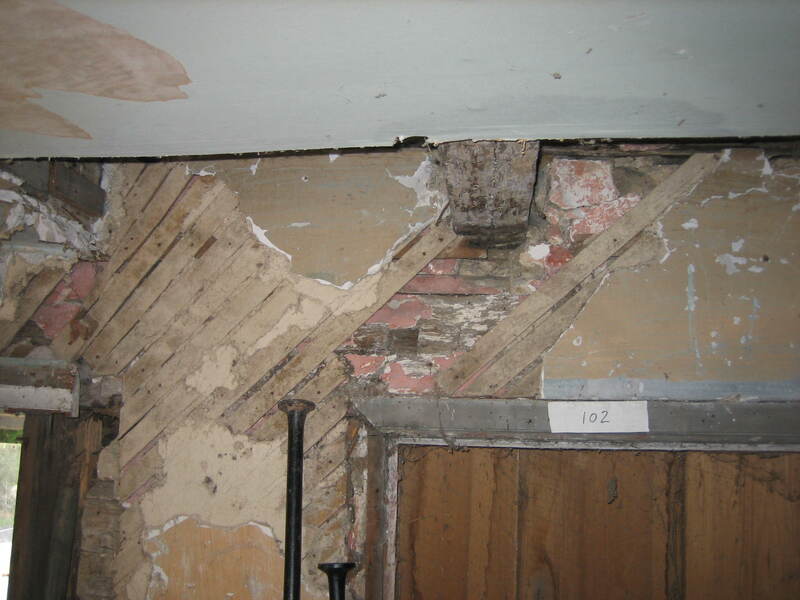 The lime plaster is the white covering surrounding and on top of the darker mud covering. This view was taken from the north facing south at approximately 2:45 PM on Monday, August 11, 2008. 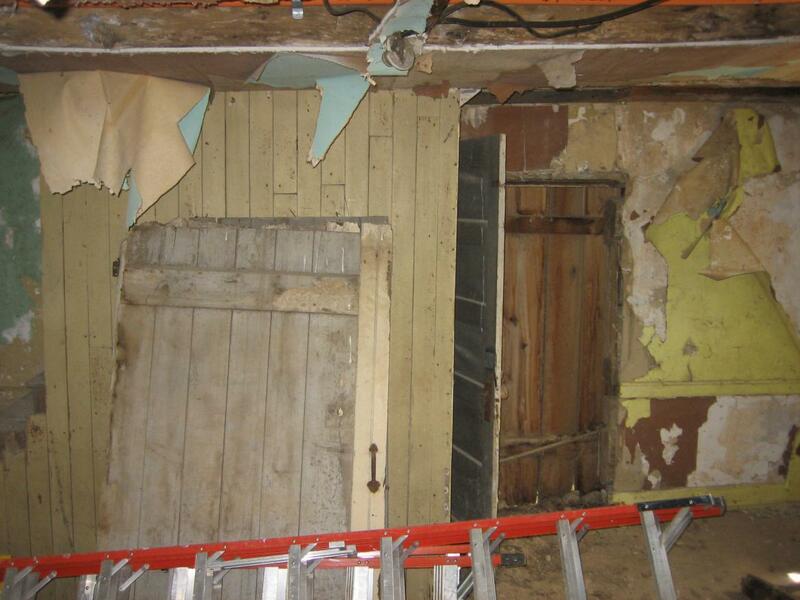 The north wall on the inside of the house shows the logs had actually been painted red. Mark surmises because they had red paint left over after painting their barn. This view was taken from the south facing north at approximately 2:45 PM on Monday, August 11, 2008. The door to the kitchen is on the right side of the east wall. This view was taken from the west facing east at approximately 2:45 PM on Monday, August 11, 2008. The fireplace was a rarity because it was completely on the inside of house. It was wooden, and located near the west wall where the hole is seen in the wall. This view was taken from the east facing west at approximately 2:45 PM on Monday, August 11, 2008. 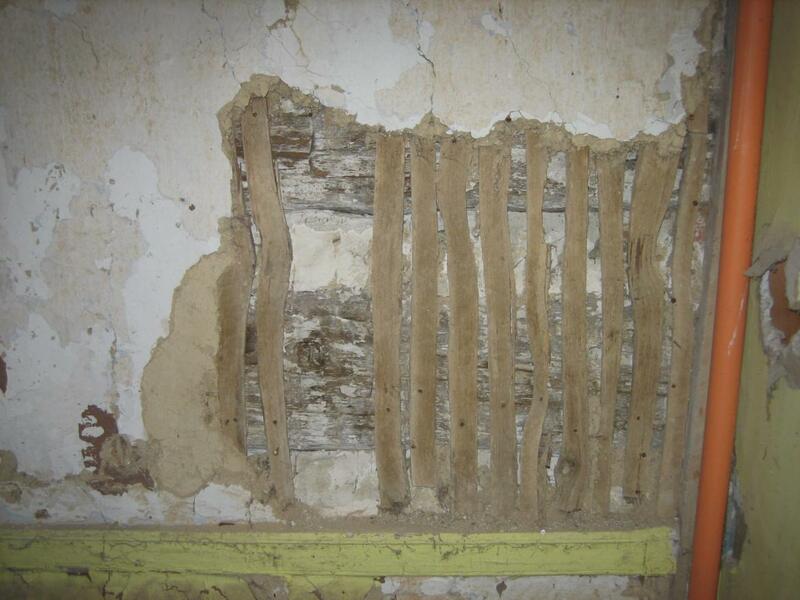 Some of the logs that constructed the house were actually brought from another structure or structures because their notches don’t match other notches in the house. This view was taken from the southeast facing northwest at approximately 2:45 PM on Monday, August 11, 2008. William Patterson was a Cumberland Township, Adams County, Pennsylvania resident. His post office was located in Gettysburg. He was born circa 1823 in Pennsylvania. This view was taken from the southeast facing northwest at approximately 2:45 PM on Monday, August 11, 2008. The 1860 census shows that William Patterson was “white,” a Farmer, and that he lived in the same dwelling and was part of the same family with Lydia Patterson (1822-), born in Pennsylvania; William Patterson (1846-), born in Pennsylvania; Elizabeth Patterson (1848-), born in Pennsylvania; Jacob Patterson (1850-), born in Pennsylvania; Henry Patterson (1852-), born in Pennsylvania; Sarah Patterson (1854-), born in Pennsylvania; Louisa Patterson (1856-), born in Pennsylvania; Louisa Patterson (1858-), born in Pennsylvania. This view was taken from the southwest facing northeast at approximately 2:45 PM on Monday, August 11, 2008. The 1860 census shows that his real estate had a value of $2000, and his personal estate had a value of $400. The original location of the well is the concrete pad in the front yard. This view was taken from the south facing north at approximately 2:45 PM on Monday, August 11, 2008.